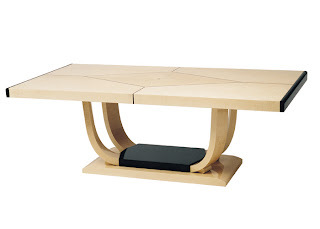 The Ruhlmann Table is one of the oldest pieces in our furniture collection. Although it was designed and first prototyped in 1988, true credit for its inspiration must be given to Art Deco master Emile-Jacques Ruhlmann. At the time we first made this table we were working with a New York based designer by the name of Ron Seff. Ron shared our love for Ruhlmann's classic lines, and he specifically deserves credit for fine tuning the actual shape of the elliptically curved legs. By no means is this design an attempt to copy anything ever created by Ruhlmann. In fact, any such effort could never amount to anything more than a copy of the original anyway. But given the influence it is only fair that Ruhlmann be acknowledged. The dining table as shown measures 84" long x 44" wide x 29" overall height. It is crafted from Curly English Sycamore, and inlaid with ebonized line details and medallions. The ebonized ends extend to receive 24" leaves, making this table ideal for hosting large gatherings. Custom sizes and shapes, as well as alternative woods and finishes, are readily available.